Christchurch driver Ryan Yardley has become the fourth New Zealander to enter the 2018 Castrol Toyota Racing Series. 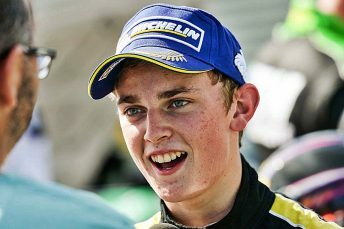 Yardley (19) may be the most excited of the four about his opportunity – in fact the Christchurch racer says he wishes the championship “could start tomorrow”. Though he knows many of his rivals have more experience in modern “wings and slicks” single-seater race cars, he is determined to do all he can to be competitive. “This is a big step up, my first category with proper aerodynamics. I’ve had 40-50 laps in a car and will be fine tuning on my single-seater form between now and the championship, including some simulator work. So I’m looking to start fast and learn everything I can,” he said. Having the opportunity to attend the MotorSport New Zealand Elite Motorsport Academy in 2014 has helped Yardley grasp the opportunity. The academy works with young racers on every major aspect of a motorsport career, including fitness, nutrition, media skills and sponsorship. The latter has been Yardley’s main focus over the past month. Just as much of New Zealand was in a pre-Christmas mode, the young racer has been on the telephone and knocking on doors seeking the funding he needs to compete. Like so many young New Zealanders before him, he needs to marry up his racing talent with the funding that will let him compete on a level footing with the internationals. Yardley says there is still space on the car for another sponsor. The Championship is televised in New Zealand over five weeks and is seen overseas in up to 100 countries. “It’s a great chance to get a Kiwi brand onto national TV and out around the world,” he said. The 2018 TRS starts at his ‘home’ circuit, Ruapuna. Yardley says having raced two seasons of the Toyota 86 Series is an advantage. First up, the TR 86 sport coupes use Michelin slicks so he is familiar with how slicks behave and understands how to get the best performance from a set of tyres. Second, the 86 series visits every circuit contested in the five week TRS Championship. Yardley’s aim is to join the battle at the ‘sharp end’ of the field, to run in the top five and to score some podiums as the season progresses. To achieve this he knows he will have to bring his ‘A-game’ from the very first practice session.